Thanks for the great tool and the hard work. about "Ulzuin's Chosen", what browser are you using? I just tried it in firefox, chrome, and internet explorer. worked fine in all. Maybe he has it cached? It has a tooltip, but some text label might help make it clearer which class the plusses belong to. I'm using Pale Moon 27.0.3 64bit. But I already had the problem using PM26 32bit. And I have them both installed using different profiles. And I regularly clear my caches. Grimcalc is whitelisted in uBlock Origin, scripts are enabled in NoScript. Also nothing changes whether cookies are allowed or not. 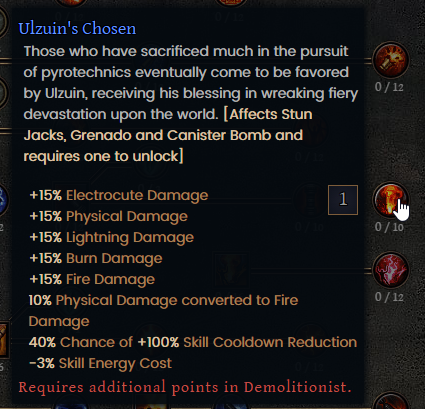 The thing is that only Ulzuin's Chosen doesn't show anything when hovering over it. Every other skill works. It also doesn't matter whether Demo is the first or second mastery. I attached a screenshot. Mouse cursor is invisible but it's directly on the skill. Just tested Chromium and there Ulzuin's Chosen works. Really odd. Is there anything different with this skill or why else could it not work in PM while everything else works? EDIT: YOU JUST RESPONDED AS I POSTED THIS SO HOLD ON, I WILL WRITE A NEW REPLY. the previous version was fine, too. theres some weird regex bug in firefox, I mean like in a firefox 15 versions ago, are you using that by any chance? in either case, can you try a ctrl+f5 on https://grimcalc.com/Mastery/Demolitionist ? I navigate by colors when picking the second class, but yeah good point you have there. first off, since you seem to care about avoiding both google and mozilla, you should -not- whitelist grimcalc for ublock. grimcalc uses google analytics, make sure you block that. however, blocking the tracking will not break the site. that is the only tracking used, and the only cookie(except for google analytics) is for saving your language preference. I am installing pale moon as we speak. Last edited by Stormcaller; 01-25-2017 at 12:22 AM. Really gotta test a site in every possible browser, as they're far from as "universally compatible" as the 'its all in the cloud' crowd would have you believe. What in the world is pale moon.........................? edit: Nuggets, make sure you read my reply above. I am checking out pale moon as we speak. 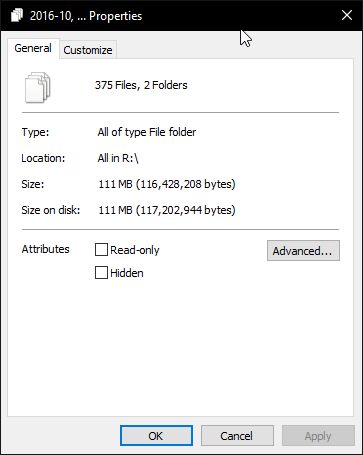 I will fix this on my next update(no ETA) if I still have a windows machine to test on a pale moon but it is not a priority honestly. is pale moon frequently updated? this should have fixed itself if they update their firefox base. edit: and I dont know whats the difference between this and other skills, probably a character thats a valid regex. can't tell honestly, sorry about that. Last edited by Stormcaller; 01-25-2017 at 12:52 AM. I have google analytics blocked in ublock. But I have Grimcalc itself whitelisted. And for testing purposes I even disabled ublock for the site. That's what I meant. And I mentioned cookies just in case they'd come up later. Already tried ctrl+f5, without success. Well, Pale Moon is a really niche browser and most people don't know about it or even care. That's why some websites and addons are pretty broken in PM (the error console is always full of errors and warnings, partially thanks to ublock and noscript). I'm already used to this stuff and sometimes I even have to switch browsers. Nothing's perfect. As much as I like PM I'm never going to force it on others or demand things to get fixed. In this case I think even Firefox 45 had the issue with Ulzuin's Chosen. But I got rid of FF45 some time ago. The browser does get updated but not that often. No rapid releases. Also PM devs insist that the browser isn't a pure fork anymore and more of its own thing. It branches off more and more from mozilla, but still uses security stuff they provide. But enough about browsers, this is about grimcalc. Thanks for the effort to look into this. Concerning the picker for the second class. I just noticed that yesterday as well and I agree that there should be some text beside the icons. But that's just for quality of life, not necessary. Any andriod versions around so I can plan builds at work?